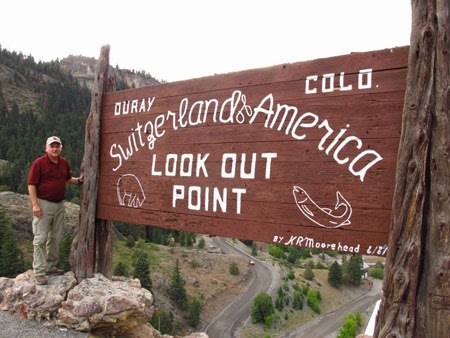 It was early evening and raining, but we only had 25 miles to drive from Silverton, Colorado to Ouray. Thing is, we were traveling on the Million Dollar Highway, a scenic mountainous stretch of very tight switchbacks and corkscrew turns with posted speed limits of 10 or 15 mph. Not mention that there’s no passing, so when we got behind a truck pulling a large trailer we were doomed to follow it all the way to Ouray. Another quirk--our GPS couldn’t decipher all those hairpin turns, and the screen just showed a blob instead of a road on this piece of the San Juan Skyway. Rain was still falling and darkness approaching quickly when we arrived in the town of Ouray, a Natural Historic District also called “Switzerland of America” because the town is surrounded by mountains. motels along the San Juan Skyway. We checked in at Box Canyon Lodge and Hot Springs, and when the rain subsided, we decided to check out the private spring-fed hot tubs just outside our room. Built on a layered wooden deck, the tubs on the third level were the hottest. Temperatures ranged between 103 and 108 degrees, which felt almost too hot at first; but then the therapeutic effect kicked in, and I felt the same rejuvenation that the Ute Indians discovered centuries ago. 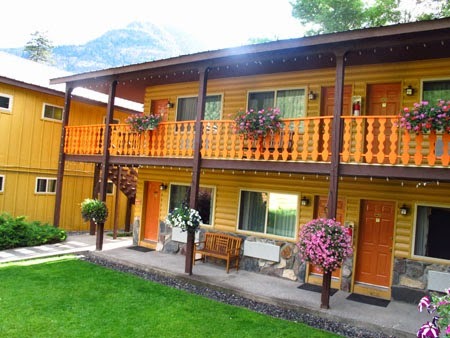 Established in the 1920s as a sanitarium where people came for the purported health benefits of the hot springs, the motel had been freshly painted bright orange with rustic wood trim. It wasn’t fancy, but rooms were clean and comfortable. Colorful flowers filled hanging baskets and meticulously-maintained gardens on the grounds. The Lodge is a peaceful, old-timey setting that has earned the hotel a TripAdvisor Certificate of Excellence and other awards. The next morning we met Terrence, the driver for our Colorado West Jeep tour. 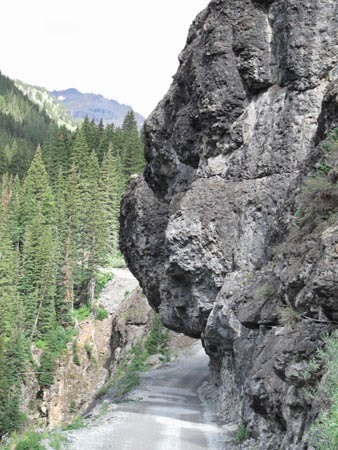 Scenic Jeep tours are such a memorable experience through the San Juan Mountains that Ouray has received another nickname: “Jeeping Capital of the World.” It’s a great way to see wildflowers blooming in summer or amber-colored aspens in autumn. Our Jeep went under Hanging Rock. Wearing jackets to ward off cool morning temperatures, Larry and I rode on bench seats of the retrofitted pick-up truck. Very quickly, on Hwy 550 south of Ouray, we saw two deer in the woods; one scampered across the road, and the other disappeared into forests of aspen, spruce, fir, and pine trees. 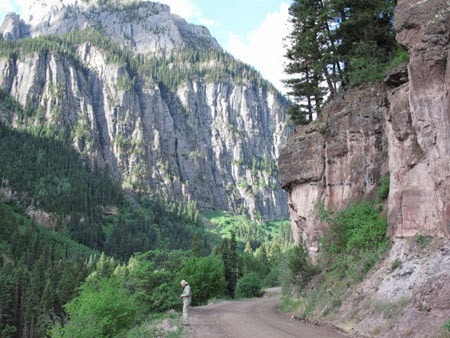 The eight-mile drive to Imogene and Yankee Boy Basins soon changed from paved to dirt road. Surrounded by towering rock walls we drove under Hanging Rock, a sturdy canopy above the road. Just below the timber line we passed the Ruby Trust Mine and a sign delineating the Alpine Tundra ecosystem. 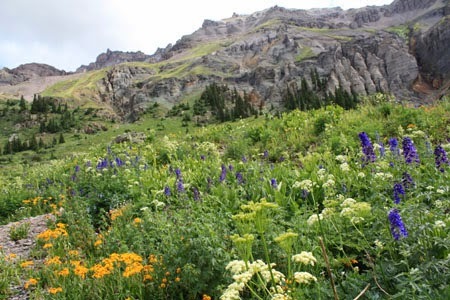 Meadows were filled with colorful wildflowers in summer. Yankee Boy Mine was discovered in 1876 and got its name because that was the centennial year for the United States. Terrence drove the Jeep into the basin and stopped to turn around when we reached at 11,300 feet. There we meandered on paths through beautiful fields filled with mountain bluebells, blue columbine, monkshead, silvery lupine, purple showy daisy, yellow alpine sunflower, pink sticky geranium, orange sneeze weed, arrowleaf ground cover (yellow with big, broad leaves), and purple asters. Twin waterfalls added to the idyllic scene and provided ample photo opportunities. Towering in the distance was Mt. 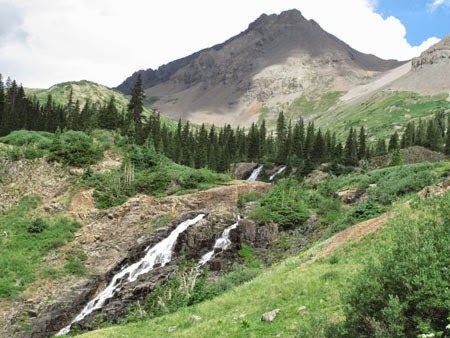 Sneffels, the local fourteener and a popular climb. 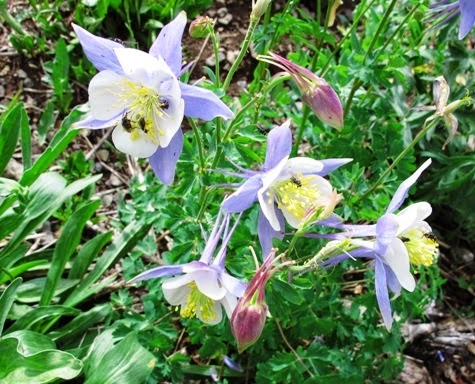 Terrence explained that climbers have a code: trailhead by daylight; summit by noon; leave by 1:00 (to avoid thunder and lightning, which can be dangerous for hikers). Outstanding scenery at every turn in the Basin. ﻿﻿ Stops on the return included Atlas mill, which had been abandoned from the gold and silver-producing Atlas Mine that operated from 1895-1900. 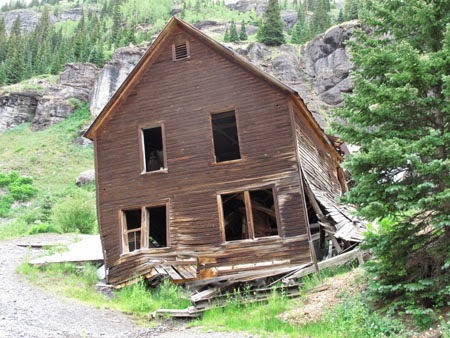 The old mining town of Sneffels had 2000 people at one time but now is a ghost town with few remnants. Terrence claimed it was “Not abandoned, just idled,” disappearing in 1934. A current revival in mining is proving that there’s still plenty of ore in those mountains. One of the “idled” mines, Camp Bird Mine, which was discovered in 1896 and operated until 1989, is being renovated into an historic site and tourist area.